Christmas in our house was wonderful, but over far, far too quickly! Liv’s birthday over the festive period meant an overload of toys, games, colouring pens and dolls, but Liv was kept occupied and certainly allowed her creativity to flow. I now have dozens of new pictures to stick on the fridge and put away in Liv’s memory box. Her favourite creative item is a glue stick… apparently you can make many pictures with a glue stick. 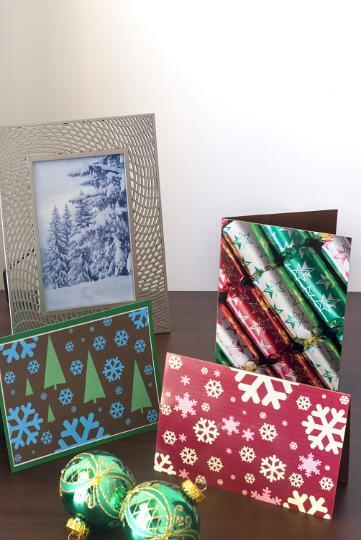 Googly eyes have been stuck on the sides of boxes and feathers stuck on Christmas cards that were due to be recycled. A good tip… if Christmas cards are going to be recycled anyway, let children cut out the pictures to stick on sheets of paper, this will develop their role play and imagination! Also using the insides of card to colour on saves on paper! I do not mind Liv making a mess in our house as bits of paper and cuttings can easily be picked up and thrown away, but when travelling to visit family over the holidays, I had to be creative myself. Proving how easy it is to jump in a car and visit loved ones, even with an excitable 4 year old, it made sense to pack a bag filled with presents that were not going to create a mess! Considering how many packs of felt tip pens, pencils and crayons Liv received for Christmas and her birthday, it was quite easy to pack mess free crayons and a pad of paper. That enabled Liv to create some wonderful pictures and give them to family members… it also kept her quiet! Taking mess free creative items for Liv meant little to clear away and everything was easily packed away again. To keep Liv occupied in the car, it was simply a case of playing Eye-Spy, singing and giving in to let her play on her LeapPad 2! With my dad’s driving it was best to keep Liv entertained, especially as we almost needed to make a trip to Carcraft on the way back! The number of looks we had from driving in a French car was hysterical! After the Christmas holidays, my fridge, freezer and cupboards are now filled with all of Liv’s wonderful creations and I am sure I will be soon making space for even more! I love the idea of you getting your car craft on 🙂 We re going through a hilarious eye spy phase (she’s 3) EVERTHING begins with A no matter what! !